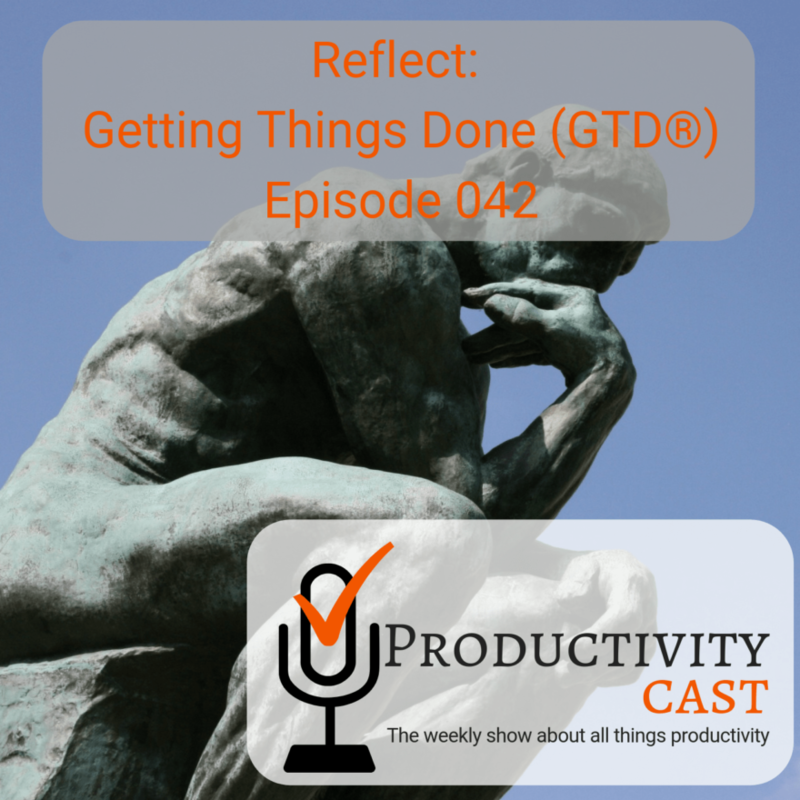 This is episode four, on Step Four of the Workflow Diagram / Map, Reflect (Review), in our nine-part series on the Getting Things Done (GTD) personal productivity methodology and eponymously-titled book, from the perspective of the ProductivityCast team–as long-term practitioners, critics and observers of GTD. In this cast, we cover the concept of Reflect (formerly Review) on your system on a frequency and in methods that work for you, so that you can iterate on your productivity and make strategic next action decisions as your life and work circumstances change. Are you ready to manage your work and personal world better to live a fulfilling, productive life? Then you’ve come to the right place. Productivity cast, the weekly show about all things productivity here. Your hosts Ray Sidney-Smith and Augusto Pinaud with Francis Wade and Art Gelwicks. See, I look at reflecting a little bit differently. Because I look at it more as a bigger picture aspect of this, when you take you go down the path of reviewing that’s a detail level. But reflecting is more if I use analogy, if you were standing by like, say, a lake and looking at the surface of the water, the reflection that you’re seeing of everything around, you can get this great idea of what’s around. But nothing’s entirely in razor sharp focus, and you’re not trying to get it in razor sharp focus, you’re just trying to get the overall feel as to what everything you’re viewing. And when I think about reflecting on what I have within my system, it’s is are the things that I’m doing taking me in the directions that I ultimately want to be going or need to be going not down to a specific step one, step two, step three. But the larger paths involved is am I going in the right professional direction, am I going in the right personal direction. i agree i think it’s we’re heading in this direction already, but I think he he he’s underplayed the importance of of the few, a few seconds, he talks about, I think, is a way more than just a casual glance or sort of a which context you happen to find yourself in kind of approach. Absolutely. And, and I think that, yeah, and I think that he paints a fairly broad brush there, he I’m quoting from the book now, he says, people often ask me, How much time do you need? Do you spend looking at your system? My answer is simply as much time as I need to feel comfortable about what I’m doing and quote, and so he kind of paints this very broad brush of do what you feel like doing, and so that you feel comfortable. And it’s a it’s a little bit more complicated than that. Yeah, but it’s a valid point. I mean, it’s a terribly fungible answer, you can do as much as you need, and everybody looks at and goes, Okay, fine. That didn’t help me any. But it really comes down to, that’s the measure. I mean, when I think about things, I’ll give you the example walking into the building this morning, I’m walking up and I’m going, you know, just in the back of my mind, I don’t feel like I have a real good handle on what’s going on in the next two weeks. So I’m going to spend a little bit of time today and just kind of recap everything, there’s that feeling you get, your hair goes up on the back your neck, when you’re like, that just don’t feel like I got a grasp on this. I think that’s where this fits. I mean, that’s basically what he’s describing. Yeah, I agree. I’m going to push back a little bit though art because this, this comes to the, to my experience, and what what I frequently find people doing is that, if you are, are highly sensitive, highly analytical, and very much stuck in the weeds of details, that these kinds of reflecting moments can become minutes to hours to a day of overwhelm, and seemingly mired in the potential reality of the day. And so I’m very frequently explaining to people that we need to, we need to sort of kind of check ourselves and understand what our either mean or modal averages are, as it relates to how much time it takes to get up to get a benefit out of something. So I agree with you that that someone who’s who’s just comfortable and locked in and ready to run there, they’re going to have this very short review moments, short reflecting moments, and they’re going to be off to the races. But for those who are struggling, and might be dealing with emotional issues, or mental health issues at any given moment in time, and, you know, it doesn’t have to be diagnosed problem for you to be, you know, experiencing low mood or something like that, it becomes then that much more difficult, and you need to start figuring out, well, how much time on average Do I need to put in in order to get a benefit out and making that cost benefit analysis very quickly allows you to be able to say, Okay, I’m now sitting here for an hour reviewing my list, this is too much and and making a cut off and getting yourself out of it. So I think I think we probably agree on this, which is that there’s a there is a rate of diminishing return once you get to a certain point. Yeah, I would, I would agree with you that I think we’re talking about the exact same issue from two different ends, because you have some people that are highly analytical who will go off of a specific measure. And I think that’s where they trip when they look at the system like GTD that doesn’t give them a specific measure, you know, gets that answer of, it’ll take you as long as it takes you and they go, Well, that’s no answer for me, and then move on. On the other end of the equation. People who are like, Yeah, I just need to a better sense of well being around this. And then they look at hard numbers and hard metrics. And you’re supposed to execute these certain and they’re like, Whoa, way too much structure here. If I were to quantify it, I’d say it’s going to take as long as it takes for you to feel comfortable with it. And that’s the first thing that you need to do is learn what that yardstick is because that yardstick does vary from individual to individual. review is a bit of a strong words, I, I wouldn’t do the timed reviews that you mentioned, every driven by the clock per se, but I do I do what’s called what I call switching, which is a review at the end of a task. So when the task is is finished, or I get a signal to start a new task, either one, I asked myself, okay, what’s the next best action to take, like, continue with the task I was doing, even though it’s run over the allotted time, or I have another meeting or another commitment. If I’m at the end of a task, what’s the what’s my original plan for the day. So it would already have a plan that says, I’d be working on this thing at four o’clock. And I asked, okay, do I stick to that plan at this point, given what I know now at four o’clock, but I didn’t know at eight o’clock? if you roll this up a little higher to corporate level or high level project management methodologies. It’s very similar to what you would have at the end of a traditional waterfall project, where you’re going to do the equivalent of the post more than once the project’s done to determine the lessons learned and those learnings or if you roll it into the Agile world, where you’re doing sprint level reviews on a periodic basis, like every two weeks to make sure that the work that needed to be done was done in the new work that needs to be done as cued up and ready to go. Both of those approaches can be integrated into what we’ve talked about so far. Without D railing the GTD review process, it really gives us an opportunity to address things on an individual basis and address things on an ongoing basis. we’re throwing up the word review a lot where we started with reflection, and I just want to make sure we’re not confusing anybody between the two? 50,000 foot level, what is the work you are here to do on this planet with your life? Really, it’s like a spear conversation. you know, we’re human, we have different commitments that change over time, we’re subject to our psychology and to the different steps that we need to take to get things done. And that seems to the that seems to always be in flux and be evolving. I don’t think there is a nice package that I could offer tour listeners that says, Okay, here’s how you handle all levels at the same time, you sort of have to grow into it. And with technology changing so fast, I don’t think there’s a shortcut. I think it’s just a matter of staying very, very aware and very, very willing to adapt your approach based on Oh, look, there is a new way of thinking about structuring high level goals. Oh, look, there is a new way to think about scheduling your time. Or look, there is a new philosophy that I could use to adapt to the one that I’m already using, I think there is that sort of somewhat chaotic process that we all go through. how many people actually sit down and go back and look through what they’ve posted over say, a week or two weeks. And instead of posting things to like Facebook or Twitter, why not use a journal app or like to do list or like keep or Evernote or something and post little things to yourself, you know, where you have that instinct of putting something out on social media capture to yourself as to Yeah, this is what it was going right man, this part didn’t work or and then going back and reflecting on those aspects using the social media endorphin trigger, that we’ve been trained to the lovely Pavlovian response to help ourselves rather than helping others. Yeah, I am. BELL RINGS, I post something on Facebook. And, you know, that’s kind of what I still waiting for my treat. But that’s what happens. That’s kind of I do that on Facebook. Isn’t that possible to cut? Is there a way to create the private journal on Facebook? You can, but I wouldn’t put a private journal out on Facebook if you paid me. So yeah, I just know there’s Yeah, there’s no reason for it to be out in someplace where somebody’s going to go sponge it for something, this is something that is personal to you. And there are tons of apps out there. Like I said, using just the basic tools, you may already be using Evernote one I’m not I don’t want to advocate throwing another tool into your pile. But if you find that it’s easy to have a focused application for this type of thing, then go find one. I mean, there’s lots of my use one called journey that works great for that. But instead of just posting it out to social media, make that comment to yourself about that this is not working, or Hey, this was really cool. And then you can go back and reflect on your system itself through the real time observations that you’re making of the system. Not a week later, two weeks later, saying, Okay, what worked last week, I don’t remember because I was busy actually getting things done. you’re bringing up a really interesting thing here which is which I didn’t even think of it in this context of of stuff but I actually use if which is IFTTT. com, I use it in order to push things that I’m posting in other social networks to Facebook, but I haven’t set up the so that Facebook only ever posts it to me. And he said it only me and that gives me the ability to see the things that you know, I might be posting on Instagram, or I might be posting on Twitter elsewhere. And that just that just kind of creates my own feed, so to speak. And it’s nothing that I’m it’s not private actually also use journey, which is a fantastic application. But the idea is, is that for social engagement, I’m using Facebook as my Facebook friends, the people in my life I actually know like, and trust that are that are in my, my personal space on Facebook. No, I don’t. I very rarely post on Facebook. Because everything that I’m posting around the rest of the world it you know, social world is basically feeding into Facebook. And I’m using the Facebook feed as my mechanism for kind of checking out where and what I’ve done. So yeah, you could totally do that. And it works. You can you download it once you’ve got it. Yes, right. there’s within the tool Slack, which is really popular within the development community, there’s what’s called the slack bot, which is basically its back end little bot that keeps things running. But one of the things you can do is you can talk to the boss, you can post things to the bot and it holds on to them for you. So not to go down the path of like virtual assistants and that sort, but taking an opportunity to leverage the tools we have, whether it’s a digital tool, whether it’s just writing notes to yourself and your notebook and in a continual journaling type of manner. But giving yourself that opportunity to have that introspection and do that navel gazing, I really think helps move this reflection and review and and system refinements to a much higher level much faster. It’s hard to reflect without having some kind of stuff to reflect on. Right? you know, I throw stuff into journey. That way, it gets a time and date tag on it. It has location tag, it even has a weather tag. And it’s just there as I’ll go back and look through it. Oh, yeah, that’s something I want to do. Or that’s something I may think about. or that’s something that maybe I should do some more research on. None of this is at the level of an action. None of it is level of a project. It’s definitely not even close to fully thought out, but it’s there and it’s not a femoral anymore. Well, this has this has been a fantastic discussion, and I’m looking forward to continuing it next week as we move our way into engaging the the doing stage the how to appropriately engage with our material, and then we’ll follow that discussion with a discussion about the weekly review itself. So like I said, that’s a that’s a big topic and we’ll spend an entire episode talking about the weekly review we will get to that and we’re very excited to be able to do so. So thank you, gentlemen, for this discussion. Do you have a question or comment about this episode, something we discussed in this episode or otherwise about personal productivity please visit productivity cast.net forward slash contact and let us know you can also comment on the show notes itself. There’s a comment area below our episode by visiting productivitycast.net/042, which is the Episode 042. And you can you know, ask a question there and one of us will will answer there. While you’re at it. please head over to iTunes or Stitcher or whatever directory us to source the podcast and give us a rating a review it helps us grow our personal productivity community of listeners and we thank you thanks to Francis and art for joining me here on today’s casts. That brings us to the close of this episode of productivity cast the weekly show about all things productivity I’m recently Smith here’s your productive life Take care everybody. And that’s it for this productivity. Cast the weekly show about all things productivity with your hosts, Ray Sidney-Smith and Augusto Pinaud with Francis Wade and Art Gelwicks.